Oh yes. Oh-ho yes. 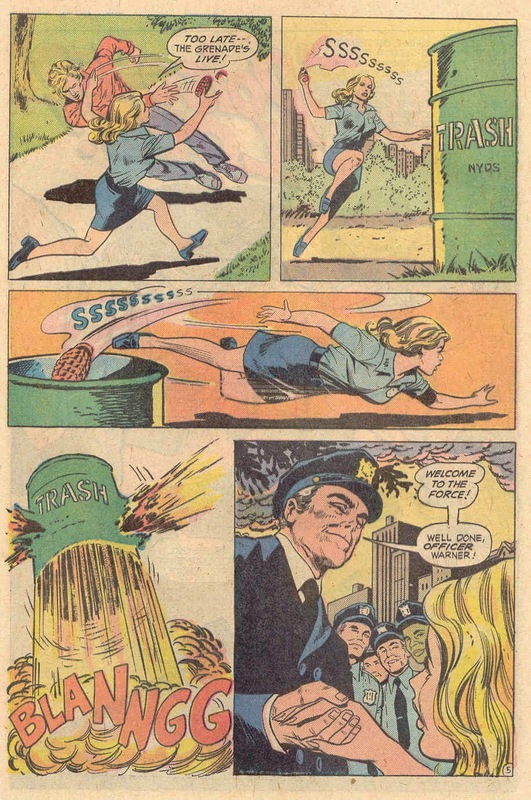 It's Lady Cop, the Bronze Age comic that singlehandedly props up the entire internet, as blog after blog after blog chuckles about and rips apart one of the greatest What the f#%?!! 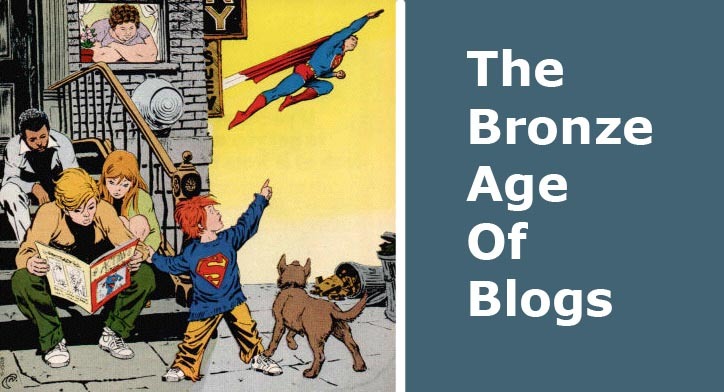 comics in the entire history of, well, everything really. What's that? You don't know about Lady Cop? Is that what's troubling you, boy? 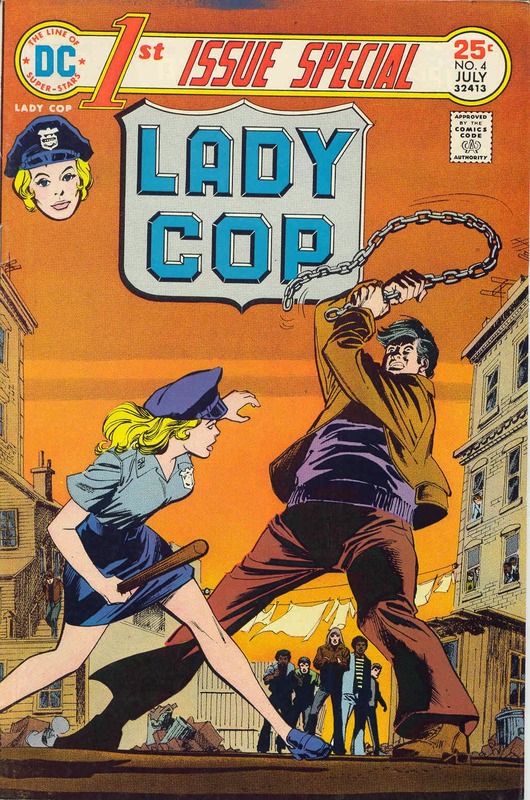 Lady Cop was another barking mad issue of 1st Issue Special ( was it the 1st issue or the 4th issue? Who can say? ) and is an absolute treasure trove for fans of wrong-headed, crazynuts comics. 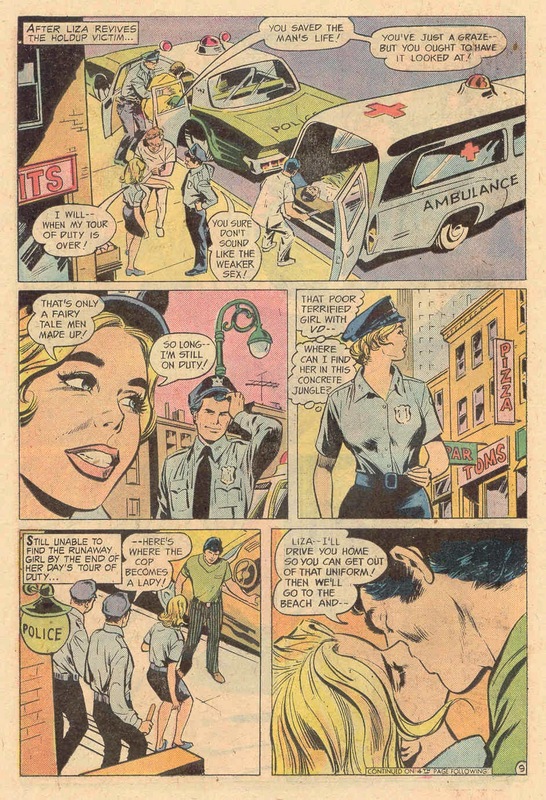 I mean, you can see what normally reliable writer Bob Kaniger was going for: A girl witnesses a murder, is driven to join the police and we see her through her first couple of days, with all the variety the job entails. Add some background with a typically sexist '70's boyfriend, and it would all be perfectly fine and dandy. People actually call Lady Cop Lady Cop. To her face. One of the many exciting subplots she gets involved in is offering advice to a girl with VD. 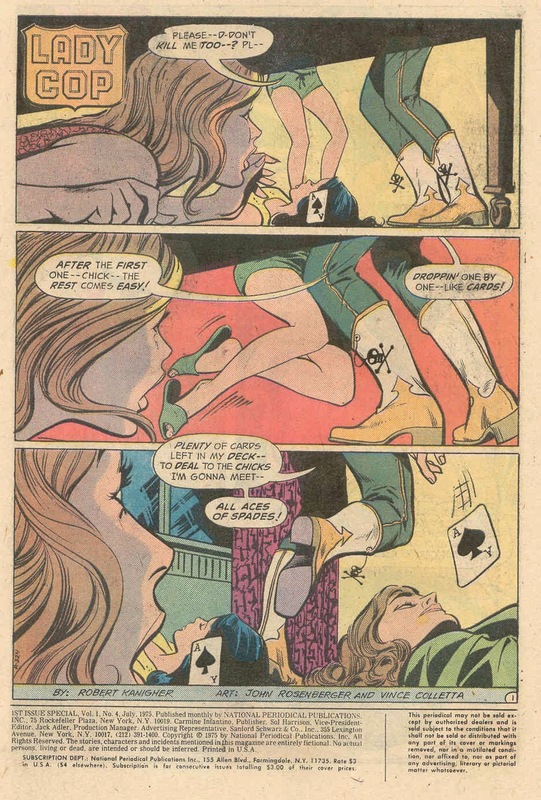 The mysterious murderer in the cowboy boots, who's as integral to Lady Cop's origin as Joe Chill is to Batman's.... is never seen again. Lady Cop is sexually assaulted, and escapes by kicking her assailant in the knackers. Wait. You do have a boyfriend, right, Lady Cop? You know where a guy's nuts are? 'Cos from where I'm sitting from you've just brushed the lower part of your leg up against that perp's inner thigh. I could go on ( and on ) about the myriad of delights to be found here, but I'll save the rest for you to discover for yourself. Except: The scene in the police academy training room with all the other inductees. Are they referred to by similar sobriquets, d'you think? Y'know, maybe there's a Brave & The Bold style team-up opportunity here. 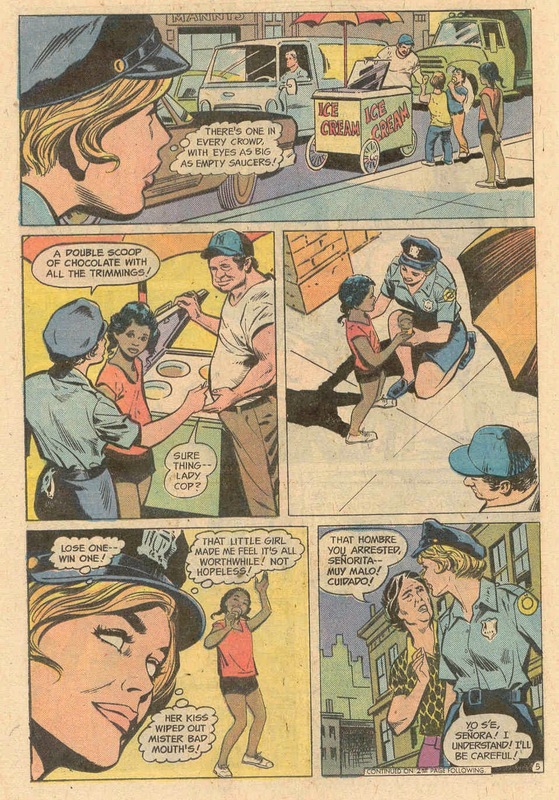 Lady Cop with Black Lady Cop, Coloured Incorrectly Asian Lady Cop, Token Male Hispanic Cop etc etc. I'd buy that comic. Ah, yes. Lady Cop. To have been part of DC's Lookit Us, We're Relevant line that included Black Executive, Hispanic Foreman, Girl Doctor, Handicapped Chef & Teen Rabbi. Sadly, it was all scrapped by White Male Editor. Seriously, though - Lady Cop!? Did DC think that such a thing was so serious an offbeat anomaly? The 70's, man... gotta love it. You can see the opening title sequence, can't you? And we all would've watched it every week. We did. It was called Policewoman starring Angie Dickinson. 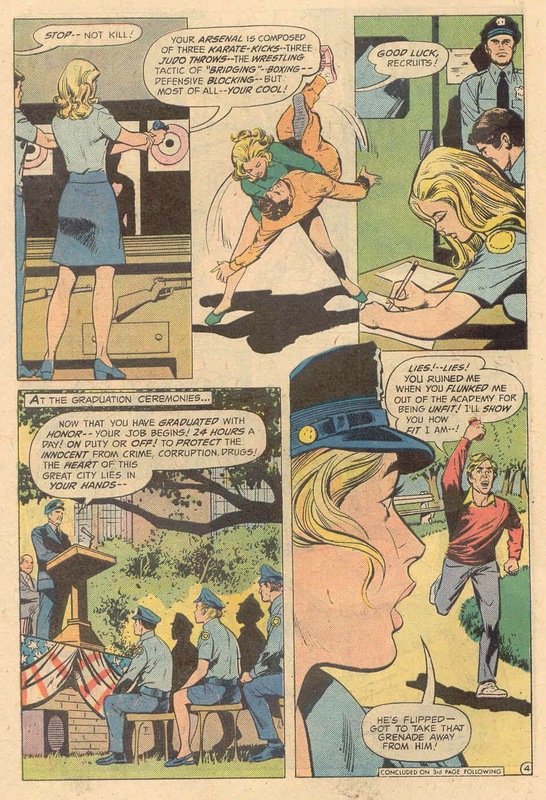 Aw, come on - it's Robert Kanigher....what did you expect? At least Liza didn't rise in a sleeping state from her bed at night, adopt a skimpy outfit and go looking for Mr Cowboy Boots, driven only by her subconscious. 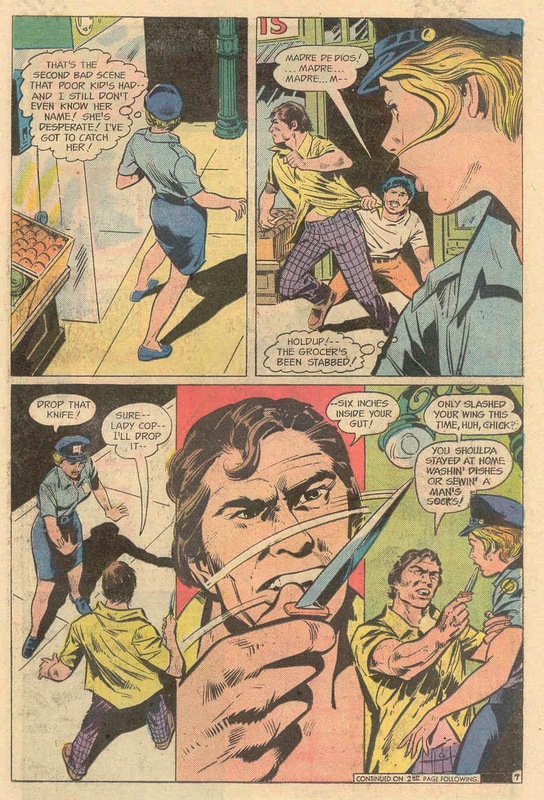 Perhaps Kanigher was saving that for the *second* issue special. Pete I have to admit you come up with the most intriguing subjects!!! Rock on!!! It's a classic, Charlie, for all the wrong reasons, and let's have a bit more love for Rose & The Thorn, B & Daniel! Psychosexually messed-up superheroine in green leather? Sign me up, I am over 18! "Mea culpa"? Well that certainly puts the "Latin" in "Latino"! 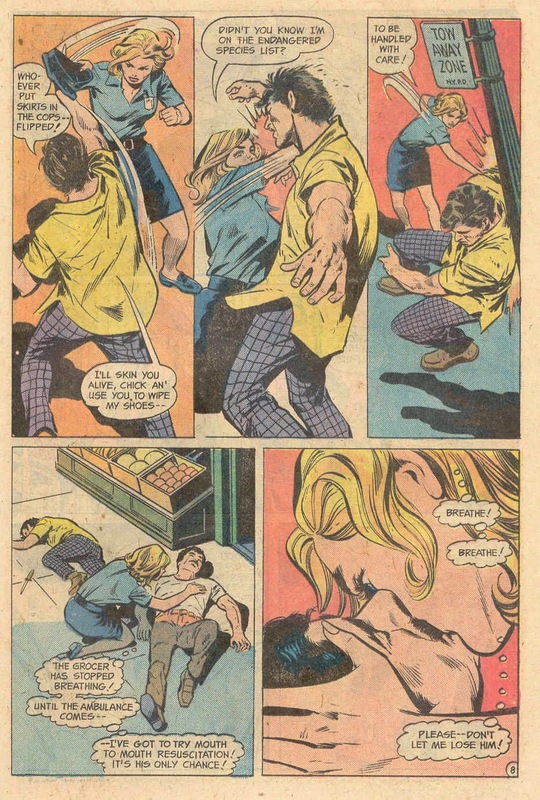 I just love John Rosenberger’s storytelling’s and layouts. Comic artists should studying this stuff. And no one in a costume, complete with figures in motion wearing drapery. One of the reasons I check this blog is because you solve mysteries!! I have a photographic memory in that I see images from long ago but, I can't always put things in the right place. 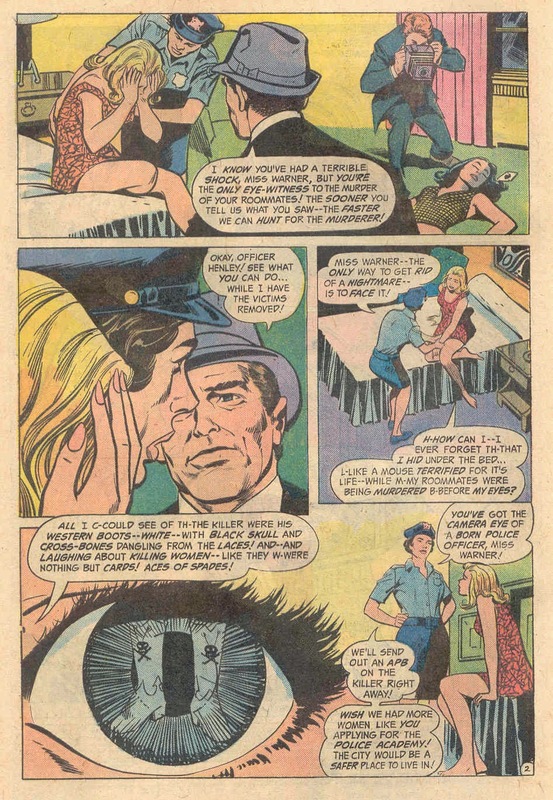 I still see every panel of every comic I ever read but, don't always know what they were. I have had the image of the boots from under the bed bothering me for decades now! My comics collection was destroyed by rats when I was young but, I finally know which comic it was!! I feel so much better! Thanks for bringing back all these moments from my childhood! I've got a Superman panel like that, one day I'll solve THAT mystery for myself! Post the details! The collective may have your answer! The problem I have is the majority of comics I read when young were "torn-covers". For those who don't know, it used to be that if a comic didn't sell before the new issue was coming out, the distribution company would ship them back to the publisher. The companies figured out that was very expensive so, they changed it to only having to ship the front cover of the comic thereby reducing shipping costs drastically. Then the distribution companies would package three torn-covers in a plastic bag and sell them for a dollar or so and recoup some extra dough. During this time my brother worked for a local distributor. He would bring home every single comic that came back after they tore the covers off. So, I literally had hundreds and hundreds of comics but, I had no idea what the covers were. 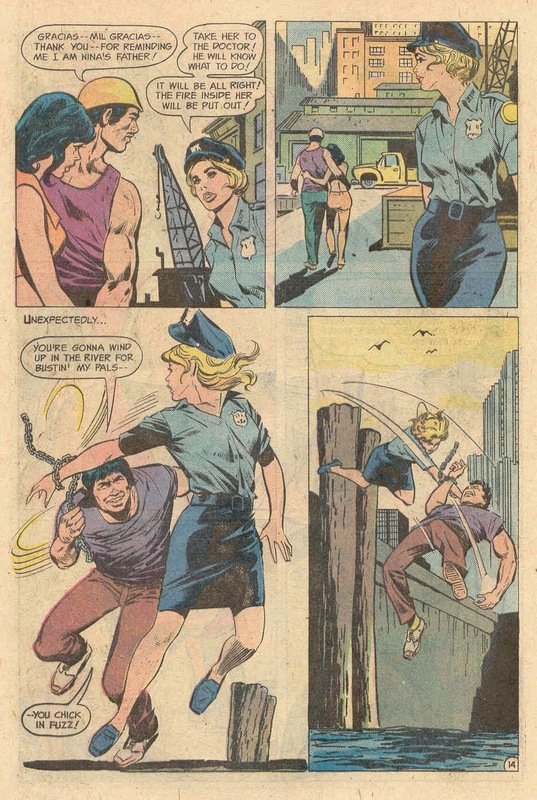 Lady Cop is a prime example! The first page is what I knew but, couldn't remember what the actual comic was. As I just loved reading comics and wasn't a collector of any kind back then it worked out great for me! Good times, good times! I've seen the cover before, but never had a chance to read it, so thanks for that Pete. Indeed. And I could never imagine her WPC Gossage giving a cut-n-paste lecture on VD. Is VD still a thing? The term, I mean. When I was a kid at primary it was a hilarious insult to say 'You've got VD!' STD seems less funny somehow. I can't imagine Joyce even thinking the word s-e-x, let alone saying the term VD. Is VD still a thing? I feel like any answer I give will mean a barrage of one liners in response! Turbo, I have what I think is that Superman comic and will probably be posting it Friday, thanks for reminding me of it - in terms of the torn cover syndrome, I also had the Double Double DC comics ( which I've talked about on here before, and that's not a slip of the key, they really were called Double Double ) which were not just torn cover comics, but 7 or 8 torn cover comics re-stapled together and sold as one grab bag book! My Nan always used to buy them for me, and I really should do another piece about them. The torn covers were a goldmine if you just wanted to read comics and weren't interested in collecting! I'm still waiting for two comics to appear that I can't remember enough about to find yet. One is a House of Secrets or House of mystery with a story about a mermaid who shows up in a small harbor town in a wheelchair and everyone loves her until they see a movie about a woman who controls a sea serpent and they turn on her. It also had a winter murder story where the guy dressed up as a snowman to get a confession from the suspected killer. The other comic could be anything. It had a story about a race that lived by waterfalls and then the waterfalls dried up and they lived off of sound. 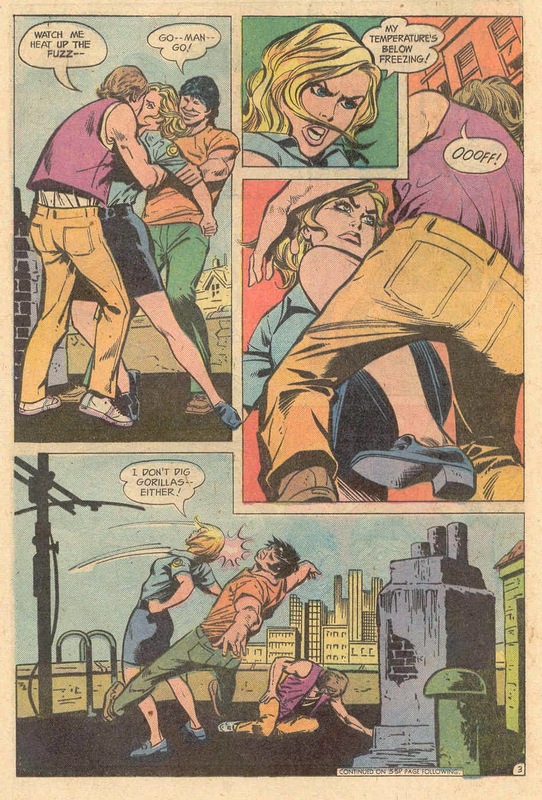 The last panel has a shriveled up, long-haired creature reaching desperately towards a woman, mentally begging her to scream to save his life. Odd stuff but, that's what I love! Challenge accepted! I love stuff like this so will do some digging, especially for the last one, it sounds amazing! Maybe I'll start a semi-regular 'Anyone know this one?' slot! Most excellent idea my good man!! I used to see copy after copy of First Issue Special in the dollar bins. Grabbed quite a few like this one, the Creeper issue, Atlas, and Green Team.